A day without Internet: Virtual life vs. real life? Can you imagine what a day would be like without the internet? Impossible, right? Internet has become such an integral part of our lives, both personal and at work. Well, my job is in internet marketing so if there was no internet, I am not sure what I would be doing. Perhaps, traditional marketing or continue with travel and hospitality sales and operations, who knows? Okay, here is how an ordinary day begins for me. I wake up to my good old radio alarm clock set to 97.5FM and based on the song that plays, I decide if my day will be good or crappy. LOL! If to my bad luck there is an ad playing, I just keep hitting the snooze button so that I can wake up to a song. I am extremely superstitious! So far so good without internet! Then its coffee time, I am sure by now everyone knows the love that I have for coffee. As I turn my brewer on and sniff the invigorating aroma of the dark coffee powder mixing into the boiling water, getting filtered and trickling down into the coffee pot, trust me, my senses come alive. I used to turn the TV on and catch up on the morning news but now with my Smartphone, TV is a second option. Thus begins my dependency on internet. Well-said, my friend! Virtual life has indeed taken over real life. This blog would not exist if not for the internet because I am a hobby blogger and not a writer. I cannot spend time contacting publishing houses and magazines etc, go through their bureaucracy to get a page/book published. 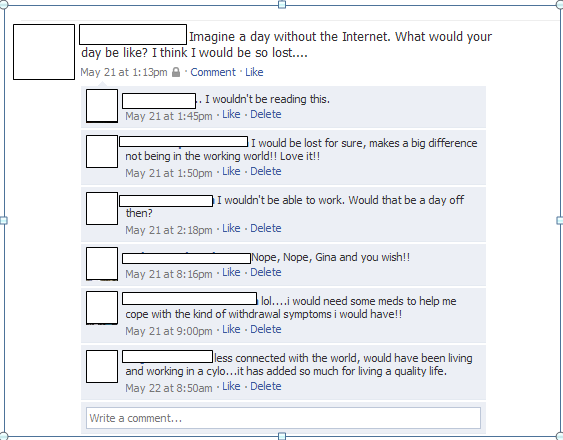 Here is another comment from a friend who is a working mother from US: “My life would be lost without the internet. 🙂 Here is why. 1. I use it to research what I should do when my baby is sick. 2. To learn about my child’s progress. What is normal in the growth process and what to expect? 3. Learn about the school systems. 1. I would not be able to function without my reservation system, e-mails, tickets, airline websites where I get all my info. 2. My phone is also linked to the internet. The comment about withdrawal symptom made me wonder if internet really is an addiction and if yes, is it as profound as drugs and alcohol? I did a simple search in Google for “Internet Addiction” and Google’s keyword choices were disorder, test, treatment, statistics, symptoms, help, facts and believe it or not rehab! Wow! There is a name for this supposed disorder – IAD or Internet Addiction Disorder. Wikipedia defines it as excessive computer usage that interferes with daily life. Well, think about it, how in the world can people have so many friends in the virtual world and divulge their whole life to them in 140-characters every five minutes and these friends are those who they don’t know or are mere acquaintances. If interested you can read more in the study published in the nih.gov site. The symptoms are supposed to be fatigue due to lack of sleep, poor job performance, apathy and decreased investment in social relationships and activities. Then there are rehab centers. Virtual life is as necessary as real life as long as you are well aware of your boundaries and privacy settings. Most important, don’t forget your real friends, real life, real garden, real farm, real pets etc. Thank you my friends for your valuable input to put this blog into perspective and see you all in the virtual world as some of you live so far away while to others, I am just a phone call away. You are currently browsing the archives for the Internet category.